OK so these are the best and I mean the best damn tator tots eva! I can not believe how awesome they turned out. I will admit I had to play around with this recipe a bit. I originally wanted to bake them. So I did and it failed....epically. Everything oozed out and made a big mess. So into the fryer they went. Sometimes you just have to fry things. Frying was the way to go. They turned out perfect. Who doesn't love crispy spuds? Who doesn't love crispy spuds stuffed with amazingness? If you don't we can't be friends ever. Just kidding! Look inside! Bacon, cheese, chives and all the seasonings all wrapped up in a crispy panko shell. Ello luv! I am not going to lie this recipe is a bit time consuming. The time though is well worth it! In a large bowl, combine the mashed potatoes, bacon, chives, cheese, and sour cream. Stir to combine. Beat the eggs and set aside. Add the flour to a bowl and mix with the cajun seasoning. Add about a tablespoon of the potato mixture into the flour. With your hands shape into a tot, and add to egg then, panko bread crumbs. Roll to coat. Use your hands to reshape back into a tater tot if necessary. Place on a baking sheet or plate. Continue with the remainder of the potatoes. Place the tots into the freezer for 30 minutes. Heat about an inch of oil in a heavy duty skillet over medium heat. (If you have a thermometer, you want the oil at about 350F.) Test the oil by dropping one tater tot in the oil. It should take about 2-3 minutes to cook. If it cooks too fast, turn the temperature down. 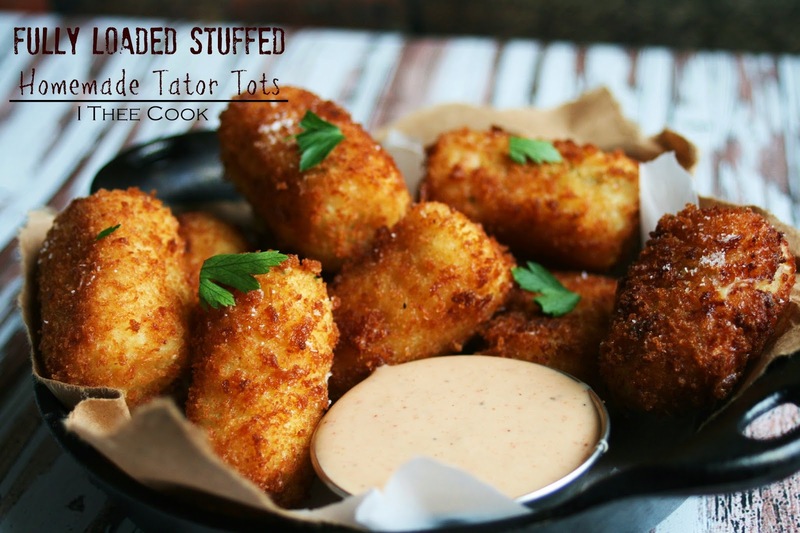 Cook the tots in batches until they are golden brown. Removing each one when done from the oil to drain on a paper towel lined plate. Salt and serve with your favorite dipping sauce. Greatest tots EVER, love these! Hi Rina! Wow! Those look scrumptious! Thank you for sharing this great recipe. Pinning it! Have a great Friday! These look so good! I love the seasonings you used. The dipping sauce also looks delicious. Can you please post the recipe? Hi Dori! That is coming soon I promise. I wish so much they could be baked, just because I hate figuring out what to do with the oil after frying, lol. I don't care those, these are on next weeks menu! Thanks for sharing on Weekend Bites! I am just drooling here! Thanks for coming and linking up at The Weekend Social. All posts get pinned in our pinterest board! Please be sure to come back next week starting Thursdays at 9PM EST on culinaryflavors.gr ! I hope to see you there! Those pictures are simply amazing...and don't worry, I love crispy spuds. (= we can be friends and you can make me some of these!) Thanks for linking up this week at #FoodieFridays! Pinning these x 2! Oh my goodness, these photos are making my mouth water! Can't wait to try your tator tots recipe. Thanks for sharing! Oh my... wow, now that's the most creative leftover mash potato recipe I've seen. Pinned. Thanks for sharing this with us on Weekend Bites. I don't love to fry but sometimes a girls gotta do what a girls gotta do, and these look To Die For! Oh my goodness these look amazing! Thanks for sharing on the Thrifty Thursday Link Up! Cannot wait to make these! I am so making these! My kids will love them and I will too! So glad you linked them up with us at Foodie Fridays and they are going to be featured at A Dish of Daily Life tonight!! Pinning and stumbling and sharing this yummy recipe! I can't even tell you how excited I was to find this! Thank you so much! I am glad you like them! OH MY HECK! I'm speechless! These look AMAZING!!! Holy Yum ~ Those look amazing! These look incredible, love this idea!!! Thank you so much for linking up at Tasty Tuesday! Your recipe has been pinned to the Tasty Tuesday Pinterest board! Please join us again this week! Rats... there goes the diet - AGAIN! I'm drooling just looking at the photo. I'll definitely be making these. I think they'd be great for brunch with scrambled eggs and good coffee. Sometimes, you just gotta do it! Wow! Those look crazy good -- pinned! Oh my, I can't wait to try these awesome potatoes. Hope you are having a great day and thanks so much for sharing your awesome post with Full Plate Thursday. Those look soo good! Pinning them to the Monday Funday board. Thanks for sharing! Rina, your Fully Loaded Stuffed Homemade Tator Tots sound so delcious! Oh these look soooo good! Your pictures are making me hungry, these look amazing!!! Oh my WORD these sound AMAZING! Sometimes frying is the only way to go. I can't wait to try these! These look amazing, I gotta try it! I've featured your post at Worthwhile Wednesdays tonight! oh my, this is a must try! the look amazing!